On Nov. 12, I awoke to wish one hero a happy birthday and another hero farewell. Similar to many other children, I grew up with the idea that my father was invincible. I know now that the superhero I called father has flaws like any other human. I now associate my father’s birthday with the death of Stan Lee, another father and superhero who died on Monday, Nov. 12 at the age of 95. 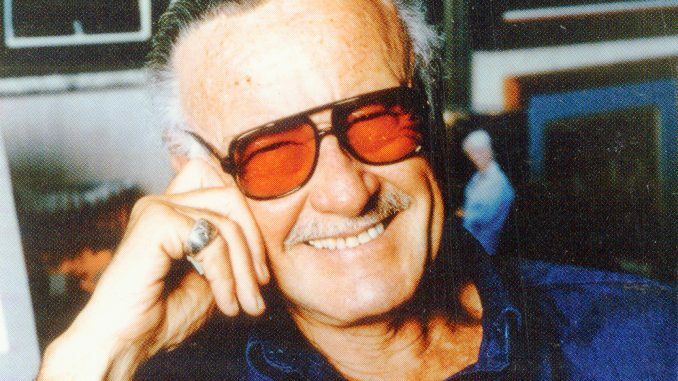 Stanley Martin Lieber, known by his comic writer identity Stan Lee, went from Marvel’s editor-in-chief to publisher and finally chairman emeritus before his death Monday Nov. 12, 2018. While the superhero universe was forced to say farewell, Stan Lee’s legacy will live on. Condolences are shared with his daughter, J.C. Lee, who while losing a father is still hoping to contribute to the industry he helped create. While J.C. Lee is left with carrying on the Lee Marvel legacy, she was well prepared with an excellent role model, a father and a superhero. While the world saw D.C. Comics’ Superman, a being from a different planet, as a savior for some time, Stan Lee introduced the new idea of a superhero that Marvel fans still relate to today: A human. “Heros show us that we don’t need to be perfect to do what’s right. It’s not about living without fear but facing injustice. It’s not about being powerful but by finding your calling when you least expect it. They show us that it is okay to be vulnerable no matter how tough you are, because even though their heros their still human.” said Stan Lee in the introduction to “The Defenders,” a Marvel TV series. A superhero is not necessarily a good guy wearing a cape or dressed in a leotard. In fact, Stan Lee purposely created these heroes of Marvel to resemble more than just a being with a good personality. From the creation of the Fantastic Four, Spider-Man, Thor, Iron Man, the Hulk and many more, Stan Lee gave his audience something real to hold onto. These superheroes are not worshipped because they are invincible. In fact, they are looked upon fondly because they too are flawed. The battles that each of Lee’s superheroes face are not always won. While they may win battles against supervillians, each character loses something or someone. The way they lose a friend or a career and how they react to it is merely human. Stan Lee took the flaws in every human and added them to create several superhero personas. Spider-Man, a web slinging neighborhood hero, started off as any other human. Known as Peter Parker, an average man, Lee created a superhero with a spider bite. After several Spider-Man spin offs, that Lee was also apart of, the audience is able to see that even though this superhero faces many villains he still has the daily struggle of a human. Peter Parker still has to keep a job, do school work and consider his family all while saving the city as Spider-Man. While Spider-Man was more relatable to the general audience, Lee knew that he couldn’t stop there. Iron Man, known as Tony Stark, a multi billionaire, did not fit the normal superhero character. Lee just had to add a failing heart and a load of sarcasm to this ruthless human to make him as loved as any other superhero. Stan Lee created superheroes out of everyone no matter their background or their morality. A superhero could be a man or women, a father or a daughter, a low income earner or a billionaire. The possibilities go on and on with each hero fighting for a different cause. By creating universes that his audience can escape to, Lee, himself is the real superhero. “You know, I guess one person can make a difference.” said Stan Lee with a cameo appearance in the movie “Spider-Man III.” Stan Lee is one person, a person who made a difference and will be remembered as epic as the hero’s he created. One person can make a difference, especially if it is your father. J.C. Lee did not just have a father and a superhero in one role model to look up to, but someone who helped her create her own superhero. While the Marvel fans will miss Lee’s cameo appearances, they are still holding onto the idea of one last superhero. Thanks to a father daughter connection, Lee’s last superhero might make a marvelous impact even after his absence. Growing up J.C. Lee had the chance to work various positions at Marvel. While she does not currently hold a position at Marvel, she is still keeping up with her art and writing skills that her father introduced to her through his career at Marvel. She has had a few art collections and published books. J.C. Lee has come forward with the claim to TMZ Magazine that together, she and her father were creating one more superhero. A superhero who will be really down to earth, as human as one can get, Dirt Man. Besides the name and a few events that lead to the idea there wasn’t much that J.C. Lee revealed about the project. The absence of glimmering armor on Dirt Man is replaced with the presence of glimmering hope. The presence of internal strength, not superhuman strength, will build up the appearance of the man who isn’t a high-class superhero with unlimited resources but a man who gets “down and dirty,” as J.C. Lee stated. This tough human, who will be flawed and yet still right wrongs, sounds like the superhero I grew up calling father. As a construction worker and hunter my father is not afraid to get “down and dirty” through work and hobbies. His passions influenced me greatly as a child. I didn’t just join along on the early morning hunting or trapping trips but also the construction jobs. He may not have always been there, but the support he provided and the guidance he gave was impactful in every choice I made. Inspiration for my art projects, my writing, and my science research usually have a connection to my father in some way. My father didn’t just support my dreams, like Lee did with his own daughter, but he helped make them happen. The same can be said for J.C. Lee and the influences and experiences she was able to gain through her father’s work at Marvel. I am thankful for the superhero in my life, but I am even more thankful to Stan Lee, who helped me realize, even in his death, that the role of a superhero and a father collide in many ways. May J.C. Lee make her father proud and create Dirt Man to show every child out there that a father’s role in a child’s life is as impactful as a superhero. His stories are great and he will be missed but his legacy and Art will live on through the Ages.